Trees are like children: you get out of them what you put into them. The more you can help with water, fertilizer and good conditions, the faster they will grow and the sooner they will come into production. New plants haven't developed enough feeder roots or storage roots to find and store the water they need to survive, so you must water new plants. Water with intelligence, not just on a rigid schedule. Place your finger in the soil above the plant's roots each day. If the soils is dry, water. If the soil is not dry then do not. The roots of a tree need oxygen, and too much water deprives them of that. Harming a plant's roots when it is young can negatively affect the plant for the rest of its life. Your planting site selection should be well-drained (better than apple trees require), non-low lying area, sandy loam soils with a pH between 5.0-6.5. The best location is a south slope, with good air and water drainage - avoid frost pockets. A sheltered north-facing slope protected from drying winds and low sun of winter may be better for cold windy sites. The most common mistake in chestnut cultivation is to plant them on sites that are too wet or too "heavy" (too much clay). Dense clay soils stunt root growth and hold on to too much water, leading to weak, slow-growing trees. Clay soils can be tolerated if there is good surface drainage (slope), but chestnuts do best on deep, sandy loams. Full sun (8hrs) is required for fruit and nut production minimum of 6 hours of full sun. Non-filtered sun. Prepare the area by removing any weeds prior to planting. This step is often overlooked but is absolutely critical to any successful planting. Weeds and grass steal light, water and nutrients from your trees. We recommend weed mats. Plant at least 2 trees for pollination, but production is better with more trees when planted 20-50’ apart. By matching your chestnut tree with a closely related cultivar (2 or more Dunstan varieties are all you need), the blooming periods should match. Ideal spacing for nut production is between 30-40' apart. Dig the hole twice as wide as the pot but no deeper than the root-ball. Do not add soil amendments to the soil such as compost, peat,mulch or organic matter, this acts like a sponge and increases root rot and robs the trees of nitrogen from the fertilizer (microbes breaking down the organic matter use nitrogen in the process). Also, do not use fertilizer, potting soil, or chemicals on your young trees. Carefully remove the tree from the pot keeping the soil around the roots intact. It helps to tap the outside of the container to loosen the edge. Do not yank the tree out of the container as this can separate the roots from the tree. Carefully separate the roots if they are root bound. Plant the tree at the same height they were grown in the pot, not deeper. Bare root trees will have a noticeable color difference between the roots and the trunk. Plant at the depth of this color difference. Partially fill in the planting hole with the native soil. Set the tree in the middle of the hole. Avoid planting the tree too deep. Using some soil, secure the tree in a straight position, then fill with native soil and firming the soil around the lower roots making sure there are no air pockets. Keep back-filling until the soil is level with the root collar. We recommend creating a water-holding basin around the hole and water the trees in thoroughly at planting. Remove the berm at the end of the second growing season. Water slowly at the drip-line. Water in thoroughly, making sure there are no air pockets around the roots. Air pockets prevent roots from growing into the soil around it. After the water has soaked in, spread a protective layer of mulch 2-4" deep around the trunk pulling the mulch a few inches away from the trunk for good air circulation. Choices for mulch, leaf litter, hay, shredded or fine bark, pine needles or use weed mats to prevent weed competition and to reduce water evaporation. Remove any ties, tags and labels from trees to prevent girdling trunks and branches. Water is the single most important factor for tree survival. If the year you plant is like the severe drought experienced by the Midwest several summers ago, if you do not water your trees they will die. The truth is that many trees die from too little or too much water during the first few months after planting. Trees are likely to get too little water in well-drained soil and too much in soil that is poorly drained. We recommend for best success to supplemental water your newly planted trees for the first two years. The amount of water needed is dependent on your soil, temperatures and rainfall. 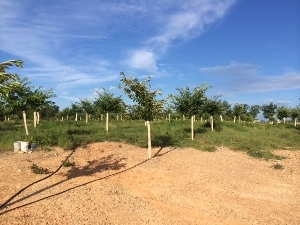 Newly planted trees planted in the spring should be watered regularly (2-4x/week) for the first year or two especially if rains are infrequent. Water thoroughly but do not over-water; the soil should dry down slightly between watering. Irrigation from lawn sprinklers is generally not sufficient until the plants are well established. This is the most critical step in the establishment of your new trees! If you plant in the fall, water in at planting, and then 1x/week until they lose their leaves and go dormant with the onset of winter. Resume watering after leaf out in the spring. Make sure water is applied to the original root ball. Adjust water according to soil type, temperature, rainfall, and other irrigation. Make sure water is applied to the original root ball. Adjust water according to soil type, temperature, rainfall, and other irrigation. Normally the East receives rainfall from frontal rains during the spring and fall, and rain storms and tropical storms in the summer. However, rainfall is not sufficient for the needs of your trees, especially in sandy soils. There are often dry periods during the fall and spring when it will not rain for weeks, which can hurt tree growth, flowering or fruit production. Despite seasonal rains, watering is very important, especially during the year after planting. If possible, drip irrigation systems are the most water efficient and should be installed if at possible to insure survival and healthy growth. These are inexpensive, easy to install, and available at most home-improvement or landscape supply stores. They are insurance for your planting. However, most food plots do not have access to wells for irrigation. In this case it is very important to haul water to the trees, such as with a tank mounted on your ATV or truck. Tanks are inexpensive and available at most farm supply stores in varying sizes. A 5 gallon bucket with a 1/16” hole drilled just above the bottom can be filled from the tank, and will also catch rain. In addition, we highly recommend the use of Grow Tubes, which will recycle the transpiration moisture given off of the leaves at night. Fertilizers can burn the tender roots of young trees before they become established. When planting bareroot trees or 1 yr old potted trees we recommend waiting to fertilize them after one year of being planted. For two year old or older trees we recommend waiting at least two months after planting then fertilize with a time-released fertilizer such as Scotts Osmocote Plus Outdoor & indoor (15-9-12) or Espoma Holly Tone, or Tree Tone Organic Fertilizer. After applying the fertilizer make sure you water your trees for absorption. Your local extension service will make recommendations along with the soil test. Strong rains can also leach away much of the Nitrogen, which is highly soluable. Nitrogen is a key element required for plant growth. It is important to provide a balanced fertilizer time release with minor elements. Minors are very important because if they are not available in certain soils, as they can be a limiting factor for plant growth. We recommend using Scotts Osmocote Plus for younger trees Outdoor/indoor (15-9-12) or Espoma Holly Tone or Tree Tone Organic Fertilizer recommend amount per directions. Spread the fertilizer evenly under the entire canopy of the tree avoiding a 5-inch area around the trunk. Mix in top 1-3 " of soil, then water in. For mature trees 10 yrs and older we recommend using Scotts Osmocote Flower & Vegetable (14-14-14), Espoma Holly tone or Tree Tone Organic Fertilizer recommended amount per directions. Once the trees are established, fertilize in early spring (Mar-April) when growth begins and again in early June with the start of summer rains. Do not fertilize in the fall, which can promote late season tender growth that can be damaged by early frosts. The best time to fertilize fruit trees is during the growing season, starting in early spring (after bud break) and finishing by July. Do not expect your trees to grow rapidly from the very start.After transplanting, the trees put a majority of their energy into root production and then are able to make rapid growth in the following years. Why we do not recommend Fertilizing in the Fall? 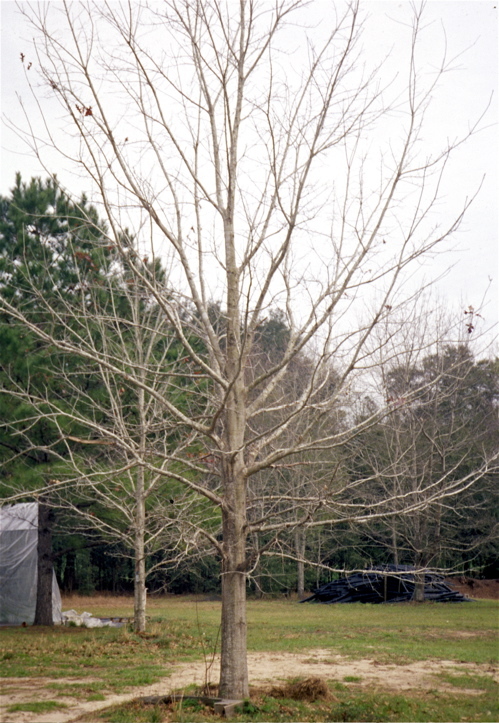 Fertilizing too late in the season can cause trees to grow when they should be shutting down for the winter. This tender new growth, when pushed too late in the season, is also more susceptible to winter injury. Soil's acidity or alkalinity is determined by pH. The best range for growing most fruit and flowering trees is between 5-6.5. Soils in much of the South fall within this range. Soils in pine woods are often lower (4.0-5.0) , and need to be raised by the application of lime or dolomite (see your County Agent for a soil test and recommended rates). Other areas (such as Texas) have soils with pH>7, which will need to be acidified or lowered by the application of nitrogen sulfate or other sulfur-based fertilizers. It is important to keep grass and weeds from competing with young trees - they are the biggest competitor for young trees and steal water and fertilizer from the new plantings. Try to keep a 2-3' circle clear of weeds from the base of the trunk. Mulch moderates soil temperature extremes and helps moisture retention as well as keeps weed growth down. We recommend Grow Tubes, because you can spray Roundup or other herbicides close to the tree without hitting the stem. If you do not use Grow Tubes, be very careful with herbicide, especially on young trees, because they can absorb it directly through the bark. It only takes a few drops to kill the tree; so apply only when there is no wind, use a colored dye mixed in the herbicide so you can see it being applied and protect the trunk with a shield or hood on the fertilizer wand. For fruit trees such as apples or pears that leaf out early in the spring, painting the trunks with white latex paint reflects heat and slows down the sap flow and potential freeze damage from trees starting to push too soon after a warm winter afternoon. Most plants including chestnuts, apples, pears, oaks, blueberries and some grapes need more than one variety to cross-pollinate and bear fruit. We will make sure that you receive more than one variety when you order 2 or more of these types of trees. Plant no farther than 50’ apart for best pollination. Pruning is usually necessary only in the first several years to shape the tree to its appropriate form – central leader, modified leader or open-vase (see pictures). Most nut trees grow naturally with a straight trunk (central leader) with only a little pruning required. Occasional pruning is necessary to open the center of the tree for greater light and air penetration. Light annual pruning of dead wood or an out-of-place branch helps older trees by rejuvenating growth and promoting better fruit production. Some trees may require annual pruning to produce the best fruit. With peaches, the top is cut at planting to open up the center of the tree for light to get in for fruit ripening. The branches grow out in a vase shape. New growth is cut back each winter, to create a better crop with larger sized fruit. Fruit-thinning may be necessary if the crop load is too high. Blueberries and blackberries are pruned back after fruit harvest to grow vegetative shoots over the summer that will bear next year’s fruit. Grape vines are pruned back to main fruiting limbs during the winter to promote optimum production the next year. Many gardeners are afraid to prune, but you should not be. Learning to do a little pruning will greatly benefit your trees and increase their productivity. Grow Tubes are plastic translucent to specific sunlight tubes that act as mini-greenhouses that protect and nurture growth of small seedlings until the tree is big enough to survive on its own. 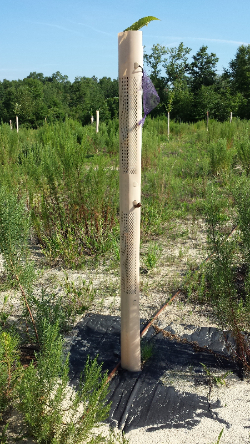 Grow Tubes are valuable planting aides, especially in locations where there is less opportunity for care, such as forest or wildlife plantings, or where there is predation by deer, mice and other critters. Remove the tree stake as it is not necessary when using grow tubes. Grow tubes help with weed control (by protecting the tree from spray and drift from herbicide) and offer cold protection in late season frosts. They can dramatically increase growth rates, and small trees often grow out of the top of a 4' tube in 1 season! We recommend Grow Tubes in many plantings. DO NOT USE BLACK PLASTIC DRAIN PIPE OR ANY NON-VENTED TUBING AS SHELTER – THEY WILL DAMAGE THE YOUNG TREE! If you don't use Grow Tubes deer will rowse the tops of the young trees. If pressure is high it may be necessary to build cages to protect your investment. 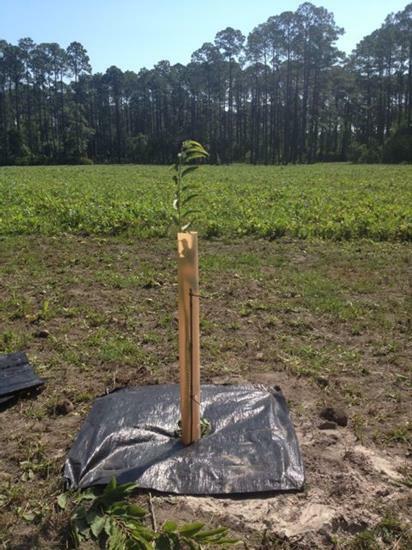 The best cages are made with 4 metal T-posts driven in the ground in a 4’ - 5' diameter circle around the tree, and then 5-6’ heavy wire fencing is wrapped around the T-posts and secured with Zip-ties. 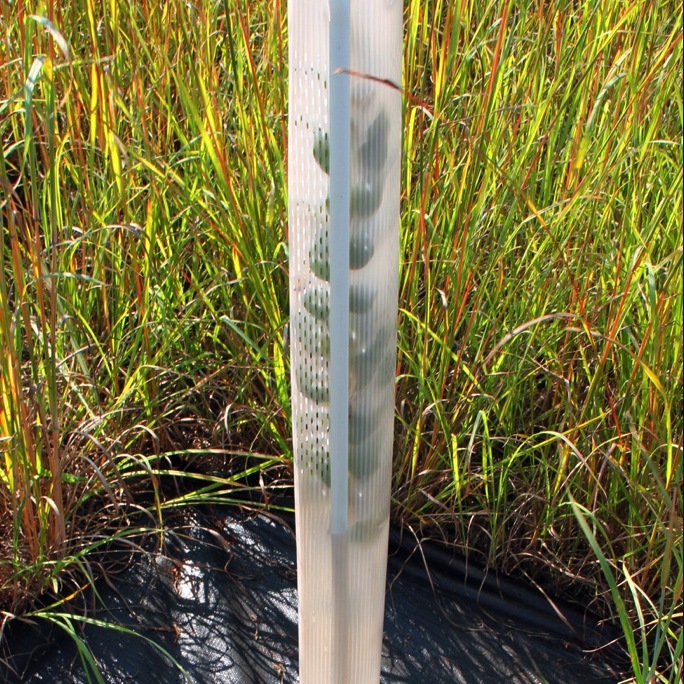 The Grow Tubes stay on the trees inside the cages to protect against small animals and all of the other benefits. In areas with bear or lots of deer, a cage may be the only way to allow your trees to grow. Chestnuts have relatively few pests. First you will need to identify the pests and in many cases you can apply cultural and chemical management practices. 1) Identify what type of bug(s) it is, by either self identification or by contacting your county local extension office to help with identification. 2) Go to your local garden center to make your purchase most offer an array of either traditional or organic products. * important to consider the benefits in using organic products vs using traditional products and the Negative impact many chemicals have on pollinators (bees, butterflies etc) and our waterways. Chestnut Gall Wasp – introduced by accident on budwood brought in illegally from China, this small wasp lays its egg in the growing shoots of the tree, causing a red colored gall to form and contorts the growth of the shoots. It can dramatically affection nut production. However, there is a predator wasp of the native Oak Gall Wasp that also preys on Chestnut Gall Wasp, and the population rise in Chestnut Gall Wasp usually triggers a rise in the predator wasp, and eventually the Chestnut Gall Wasp population declines and gets back into ecological balance. For more information click HERE. The best prevention is to never buy trees from nurseries that are in Gall Wasp territory (essentially all of the eastern U.S. except Florida). You cannot tell if budwood or trees are infected because the larvae are microscopic and not visible to the eye. Chestnut Weevil – this pest is spread throughout much of the eastern U.S. It is a small insect that lays its egg in the forming nuts on the tree, resulting in a worm inside the nut. The nuts fall to the ground, the worms crawl out of the nut and burrow underground, emerging the next summer as adults to repeat the cycle. There are chemical, cultural and post-harvest treatments available to control chestnut weevils. Ideally, a combination of cultural and chemical management would control the pest and eliminate the need for post-harvest treatment, which can diminish quality and the marketable yield. For more information click HERE. Ambrosia Beetles - Ambrosia beetles were introduced into the Southeastern United States from Asia. Although it is still primarily a southeastern pest, the beetle is spreading into other areas. They are rarely seen because of their small size and the fact that they spend most of their lives inside trees. Most ambrosia beetles attack weakened, injured or dying trees and shrubs. Some attach fresh-cut wood as well. A few species attack apparently healthy trees and shrubs. The first signs of damage by this beetle are fading or wilting of the foliage on the terminals of infested twigs and branches. Close inspection will reveal the presence of a tiny entry hole on the underside of the affected branch. The symptoms of an infestation and granulate ambrosia beetle damage are unmistakable. As the female beetle tunnels, strands of boring dust, which look like toothpicks, extend from the tree. Young trees infested with the beetles usually die, but older trees may survive. These beetles carry a fungus in their mandibles with which they inoculate the trees they infest. The larvae feeds on the fungus colonies, and it’s the fungus that is usually fatal to the tree. Ambrosia beetles sometimes attack healthy trees, but they are especially attracted to trees suffering from stress. The insects enter at sites with damaged bark. Most ambrosia beetle prevention begins with reducing stress associated with trees. Prevent stress as much as possible by watering the tree deeply during dry spells and keeping it on a schedule of regular fertilization as recommended for the species. Remove and destroy severely infested trees to prevent the infestation from spreading. The initial attack by this beetle occurs in the spring. The first major adult is in mid-to late-February when temperatures exceed 65F. As the female bores into the wood, a thin, toothpick-like strand of sawdust is pushed from the tunnel. This may extend an inch or more from the surface of the bark. While the females prefer to attack stems under three inches in diameter they will attack stems up to eight inches in diameter. The entry hole is about 2 mm in diameter. The tunnel goes straight into the heartwood and then opens into a cave-like brood gallery with one or two side galleries. A major emergence of females occurs in early spring. Host plants may be heavily attacked at this time. If the host is vigorous enough, the beetles may be drowned or forced out by heavy sap flow. If the host is weak or not producing large amounts of sap, the attack will be successful. If these treatments fail, and the trees die, all the research says to cut down the dead tree and burn it. Chipping does not get rid of the beetles. The Dunstan Chestnut is the most widely planted chestnut tree in America. It has been proven blight resistant for over 30 years, and there are many successful commercial orchards of our trees all across the eastern U.S. Chestnuts are the best tree to attract deer and wildlife! They evolved with chestnuts as the primary mast tree for thousands of years before the blight. Independent tests show that deer choose chestnuts 100:1 over acorns. We specialize in new varieties of apples, peaches, nectarines, plums, and berries, bred by the University of Florida for the mild winters of the Deep South. We will make sure you plant the right varieties for your area. We also grow many types of unique fruit, such as persimmons, and pomegranates. 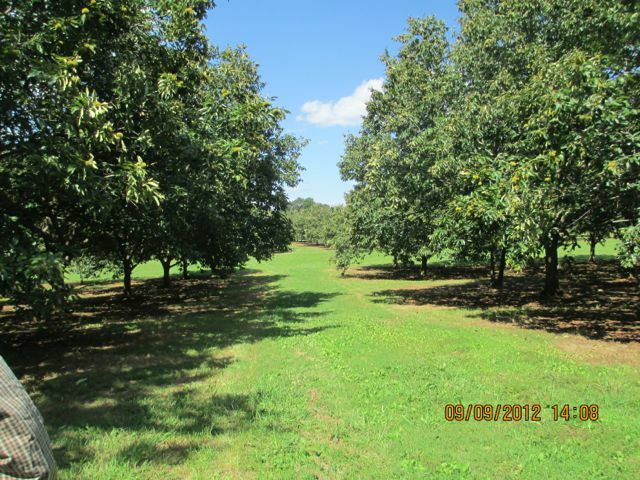 Dunstan Chestnuts are a profitable orchard crop with virtually unlimited market potential. They begin to produce in only 3-5 years, can bear 1,000-2,000 lbs per acre and bring $3.00-$6.00/lb wholesale depending on the market. Email: chestnuthillnursery@gmail.com For retail mail orders only. Email: chestnuthilltreefarm@gmail.com For wholesale orders only.